There will be lots of information presented to help you excel at the clarinet, and plenty of time to practice so that you master all of these new concepts! ICE attracts students from all over the state, and classes will be arranged so that you get to meet new people every single day! Group activities outside of class time will encourage making new friendships that last. No one wants to play cool music more than the faculty do! Many of them bring their own arrangements and compositions to spice up the repertoire for the small and large ensemble concerts. Part of the camp experience includes performing a final concert at the Bloomington Playhouse in downtown Nashville. Playing music for ourselves is fun, but playing for other people is even more satisfying! Again - the faculty love to bring cool music. 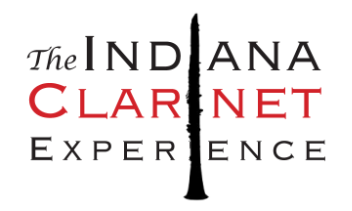 Students will have the opportunity to hear performances by innovative clarinetists in the professional field. This is your chance to learn more about the clarinet instrument family. You can play E-flat clarinet, alto clarinet, bass clarinet, and contra bass clarinet! The end of the camp includes a clarinet choir concert, where people will play all kinds of strange clarinets, big and small! It's only a week, but the memories will last much longer!! Many of our participants look forward to returning each summer to meet friends from around the state. "By the end of the week, I had made friends with every other person in the camp and everyone improved a lot. Not only did we have fun playing games during breaks, but the music was really fun too! I was always surprised when it was time to leave at the end of the day, because the time flew! Great food, great friends, great experiences." ~ Chelsea C.
​"ICE 2015 taught me more than I could have imagined in just one week. It also allowed me to bond with many new people over a common love of the clarinet. Every single aspect of it was great, and I would definitely participate again!" ~ Will Z. "I don't think I really knew what to expect when I walked in the door on the first day, but I knew when I walked out on the first day that I couldn't wait to come back the next. Everyone there - students and instructors - are so supportive. They just want you to thrive and to see you grow as a clarinet player. I can't wait to hopefully return this year!" ~ Brittany D.
"The Indiana Clarinet Experience taught me many things. I learned new breathing exercises and improved my knowledge about specialty clarinets. At ICE I met new friends and had lots of fun. I highly encourage others to come to ICE to have a fun and rewarding camp." ~ Lucy Mae W.